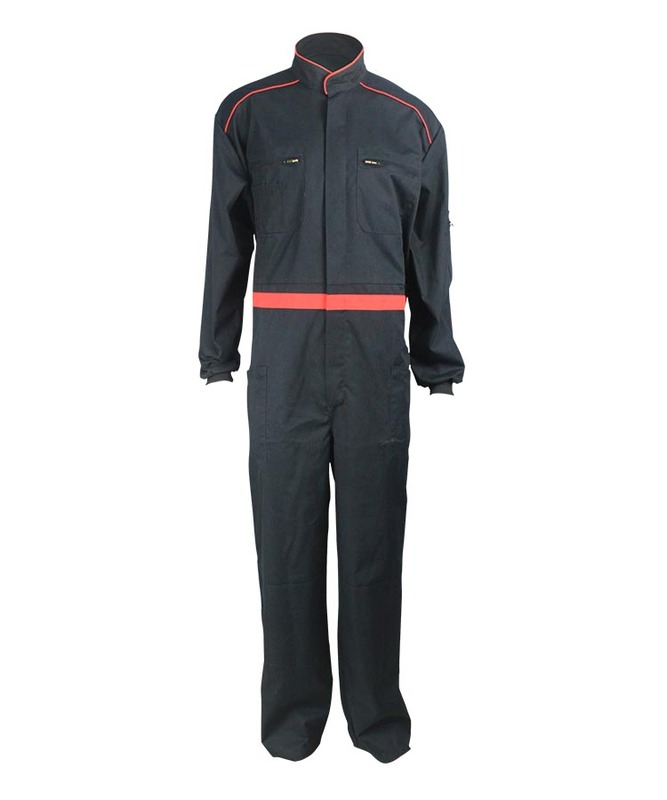 This cotton nylon flame retardant coveralls made of 280gsm cotton nylon flame retardant fabric, and can meet EN ISO 11611, EN 61482-1-2, NFPA2112 and other standards. 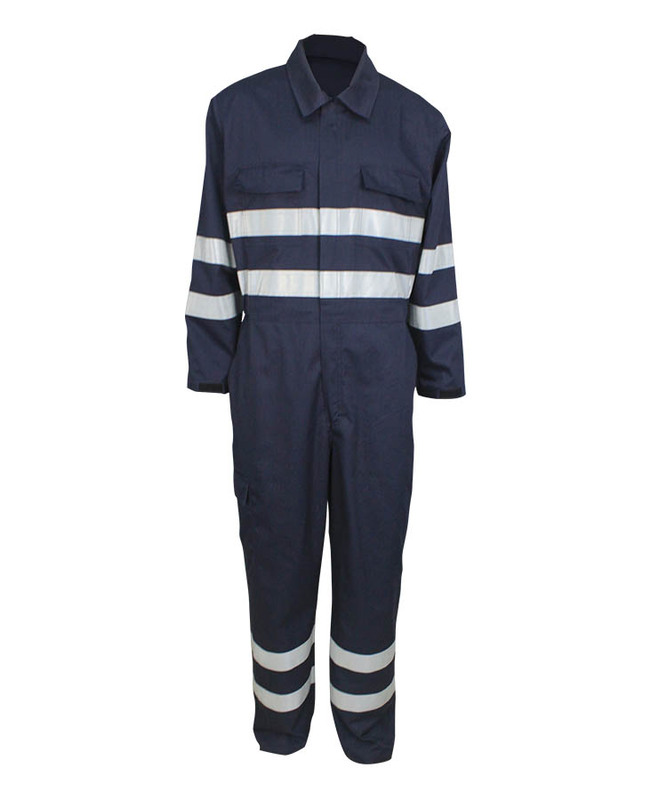 This cotton nylon flame retardant coveralls adopts the most popular natural fiber cotton fabrics, in combination with Yulong's sophisticated flame-retardant technology, the cotton nylon flame retardant coveralls has the effect of self-extinguishing with no droplets, char length can be controlled within 10cm, soft touching, good strength, good wear resistant property. 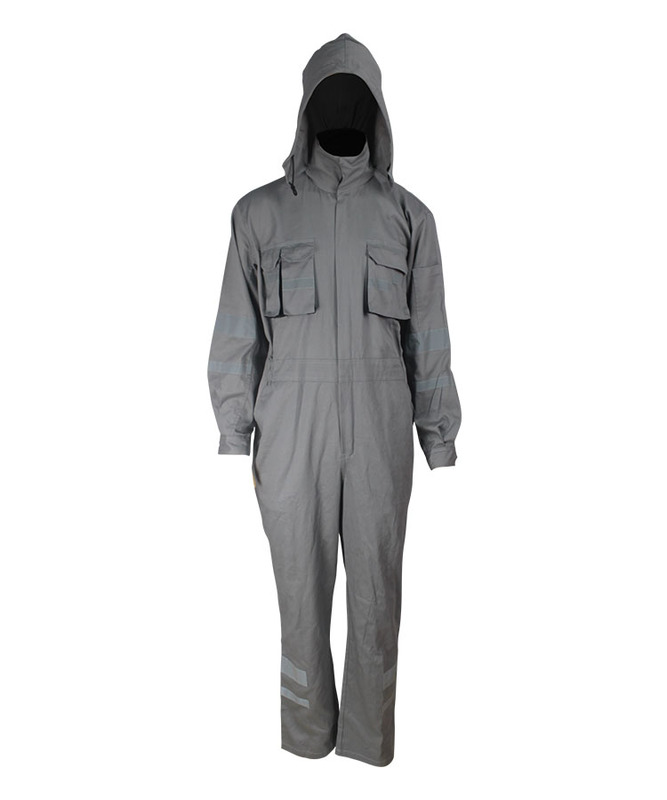 The cotton nylon flame retardant coveralls can better protect human body from hurt. Arc proof property better, and is popular with EU/US customers. Two patch pocket with flap on breast, flap with 0.6cm wide single line pro-stitch, pocket with double line pro-stitch , closure with invisible snap button. Front body reflective strip go through the breast pocket and flap to form a straight line, the process requirement is more precise. 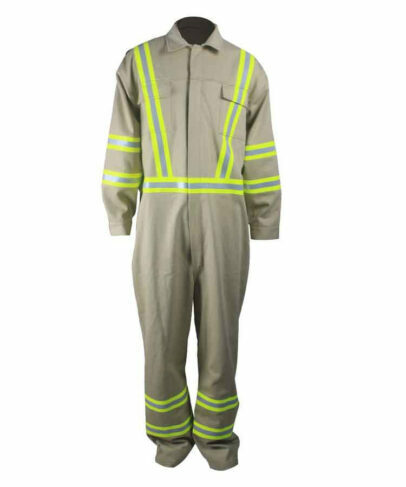 Slant pocket and air pocket on the two side of the cotton nylon flame retardant coveralls' pants, can touch the inner clothing through this air pocket, pocket mouth and flap were strengthened with bartack which can extend the service life of the pocket. Patch pocket with flap on the hip, with double line pro-stitch, closure with invisible snap button. Double layer folding at the bottom of the pocket, more secure. Turn-ups sleeve cuffs with splits, sleeve placket rooftop, cuff closure with snap button and size can be adjusted, much practical. 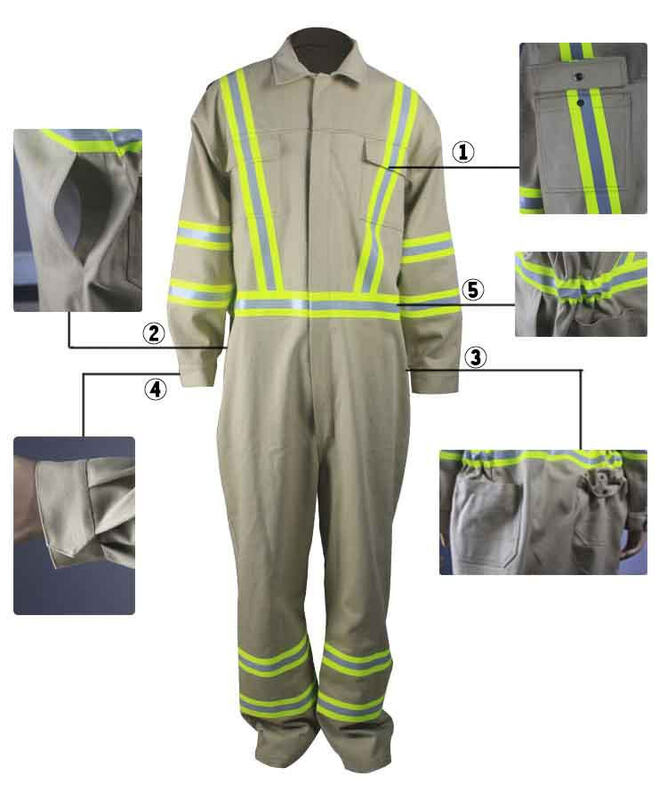 The seam on the waist was covered by the reflective strip, elastic band on the two sides of waist and is adjustable, suitable for different size of people. Front part of upper body was jointed by two pcs fabric, with 0.6cm single pro-stitch. All snap buttons are invisible one, the stem of the metal snap button not touch the naked skin. Can separate the wearers’ from the heating very well. 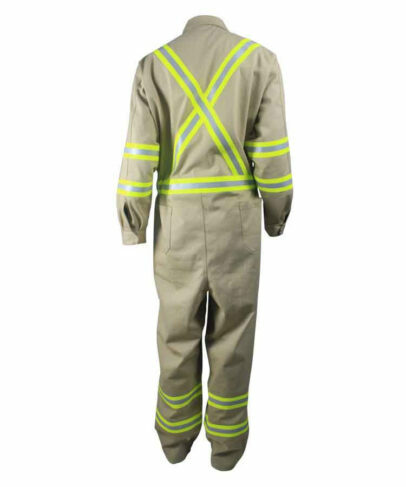 One piece FR warning reflective strip on the waist, two pieces FR warning reflective strip on the arms and legs, two crossed FR warning reflective strip on the back, all with single pro-stitch. Much modern and conspicuous. 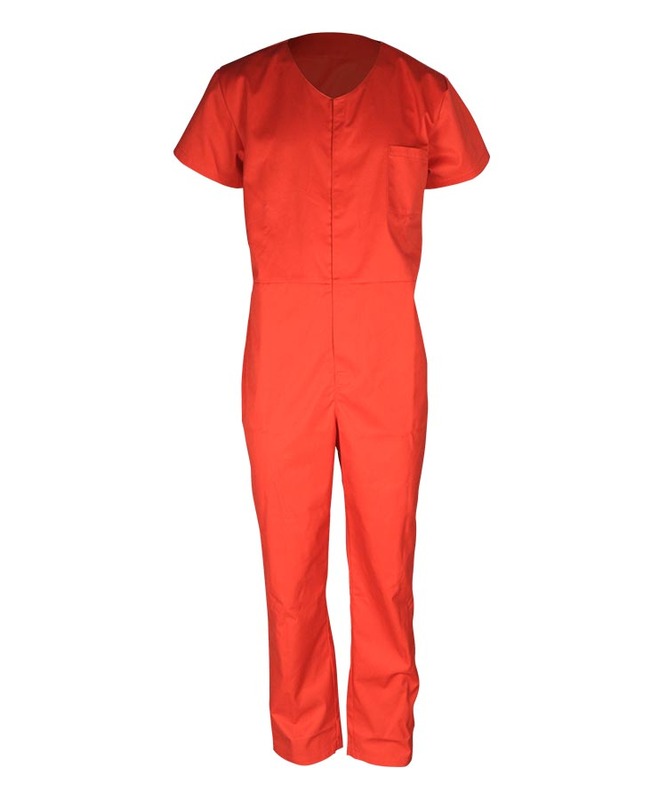 Shoulder seam and armhole pieces was sewed with five wire and double visible stitch. Pretty stitch and high strength. Front opening of pant closed with double closed metal, much practical. Beautiful upper front placket, neck and waist line closed with snap button.